Research on high impact practices (HIPs) demonstrates that students who engage in integrative learning are more successful in learning situations, especially when (1) they articulate what they are learning and (2) they articulate the value of what they are learning. In this context, one reason that faculty and students appreciate ePortfolios is that they provide a site for such integration. Put another way, students find in ePortfolios a space for making connections across contexts--across courses, co-curriculars, work sites, and personal experiences. Providing space, however, isn't the same thing as helping students make such connections and make sense of such connections. 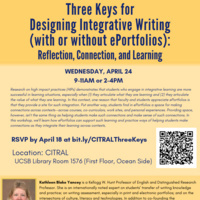 In this workshop, we'll learn how ePortfolios can support such learning and practice ways of helping students make connections as they integrate their learning across contexts. Kathleen Blake Yancey is a Kellogg W. Hunt Professor of English and Distinguished Research Professor. She is an internationally noted expert on students’ transfer of writing knowledge and practice; on writing assessment, especially in print and electronic portfolios; and on the intersections of culture, literacy and technologies. In addition to co-founding the journal Assessing Writing and co-editing it for seven years, she is the immediate past editor of College Composition and Communication, the flagship journal in the field.